What is the 25th Wedding Anniversary name & symbol? Congratulations! 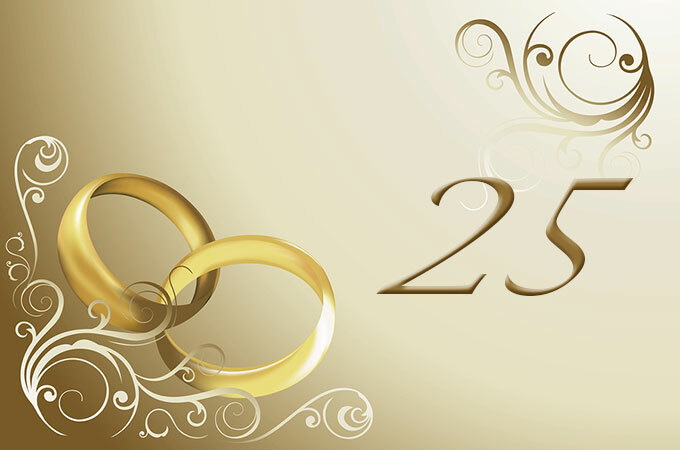 The 25th wedding anniversary or Silver anniversary is a memorable year and a joyous celebration. After a quarter century together your relationship is a shining example of love and commitment. For the silver anniversary, Silver is one of the most precious metals known to man. It has always been prized the world over and considered very valuable. It is therefore an appropriate symbol for the twenty-fifth wedding anniversary. Like silver, may your marriage continue to shine in splendour and radiance all of your days as you grow old together. Planning a 25th wedding anniversary is an exciting task. A 25th (silver) wedding anniversary is an occasion that any couple should be proud of, and deserves to be celebrated in style. Give any gift either made of silver or silver in colour. Many couples choose to celebrate their 25th anniversary with a gathering of those they love, been planning a special luxury holiday while others choose a quiet night in together. What gift shall I get my Parents on their 25th wedding anniversary? Sometimes, the best gifts are handmade. Why not let your creativity loose and make something that features silver. A scrapbook, handmade card laced with silver decorations or your own piece of designed silver jewellery can be a long lasting and well received gift. Personal inscriptions make a gift that is more special and if you use a beautiful quote or short piece of personalised poetry, then it can also be a very romantic gesture too. 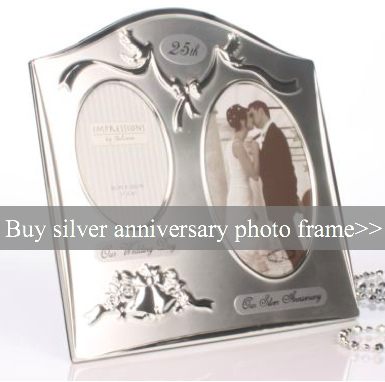 25th wedding anniversary gifts don’t have to be silver products, you can use the idea of silver within your gift. By creating a theme of silver, you open up many more doors for ideas. The traditional flower is the Iris, it represents promise, faith, hope, wisdom, valour, ‘my compliments,’ your friendship means so much to me, passion and promise in love. What can I buy my husband for our 25th wedding anniversary? Personalised message in a bottle. What should I buy my wife on our 25th wedding anniversary? Silver photo frame with personalised stand. Outdoor activities (drive a vintage car, balloon rides). UK City Break (include a visit to places of interest). Organise a large surprise party with family and friends. You and that special person in your life are celebrating a wonderful milestone of spending a quarter of a century together. Enjoy!